… was taken at a marina in the harbour of Kardla on the island of Hiiumaa, Estonia. I've no idea where they got aquatory from. My father said something in Bulgarian and wanted it translated into English. What he said sounded like 'the aquatory of Bulgarian ports'. Aquatory in my language means "water territory". Since I had not seen it used in English, I was looking for a way to rephrase it, at which point I came up with 'territorial waters'. 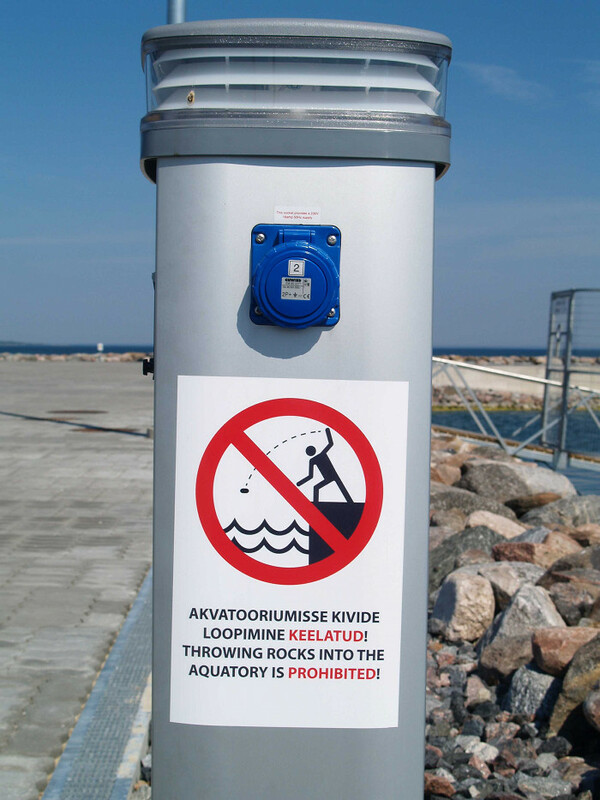 The Estonian version of the sign has "akvatooriumisse", which is ackvatoorium "aquatic area" plus the illative case -sse. And since "akvatoorium" would correspond in English to "aquatorium", we're most of the way to aquatory. But it's not clear why Estonian and Bulgarian would share a Latin-derived term that is missing from English — neither "aquatory" nor "aquatorium" is even in the OED. Russian/Soviet influence, maybe? Or German influence? Reminds me of the local swimming pool in the 1930s, swimming pool wasn't good enough, they called it the aquarena. 'Aquatory' has a number of occurrences in Google Books, and it does seem to be used as a technical term for a marina/port pond or water enclosure of some sort. Many hits (GoogleBooks English) come from Russian/Soviet sites, some from Scandinavia, below are links to what appear to be US and Australian usages. Aquatorium is virtually unknown in German. It is neither in my native vocabulary nor is it listed in the Duden or Wahrig dictionaries. Googling over German-language pages primarily turns up its use as a proper name for a former water treatment plant and now convention center in the city of Mülheim an der Ruhr; misspelled references to the Äquatorium at Duisburg zoo (a building that houses equatorial animals); and Croatian tourism sites. It pops up in a few dubious online dictionaries and a hit in Google books lists it as a variant of Aquitorium, an obscure jargon term designating a country's water area in international law. But it is in Eesti Keele Sõnaraamat, Eesti Keele Institut, 1999. The definition there is "püsivalt veega kaetud ala, veeväli, veeala. Ookeani, sadama akvatoorium." Which I translate as "a body of water covering a large area. Ocean, harbor akvatoorium. So it would seem to fit the sign. Because akvatoorium follows the form of some English words brought into Estonian, I would not be surprised if the person translating the Estonian simply converted it to an English form. Or that may be the translation in an older Estonian-English dictionary. I don't know enough Russian to speculate whether that's an influence. You might also look to Swedish – Hiiumaa and Saaremaa were long Swedish possessions and settled by Swedes. Акватория is a technical (but widely known) term for body of water "limited by natural, artificial, or imaginary borders". Wikipedia has this term explained in Azeri, Samogetean(Žemaitėška), Belorussian, Bulgarian, Estonian, Lithuanian, Serbian, Ukrainian, and Uzbek. How's that for linguistic evidence? Aquatory has to mean something more specific in this instance than "large body of water"; else why would they care if you throw rocks into it? It only has to mean "something more specific" in that it refers to the specific body of water next to the sign; presumably the reason it's forbidden to throw rocks in this akvatoorium hinges on something other than the mere fact of its being a large body of water, but there's no reason at all to think that's reflected in the wording. IIRC in the context of ports in Bulgarian it means something like the waters reserved for the operations of the port and is under the control of the port authorities, I could ask a friend who works as a ship navigator. Not mentioned, but I find the wording of the English kind of off-putting, hostile and not very idiomatic. For me (US native) "do not throw rocks in the water" would sound/read better. This happens in Poland too with 'forbidden' showing up a lot in English translations and making them sound more threatening than the Polish originals. Thanks to a particularly funny Soviet cartoon, in my mental vocabulary, the word meant specifically something along the lines of "the water area of a port". In retrospect, I did encounter the non-port meanings elsewhere, so I suppose it does make sense it's somewhat more general in meaning. Never thought that the word didn't exist in English… is this one of these cases where a language not having a word for something is actually true? Perhaps the English word this sign is groping for is waterway. die Erde vs. das Erdreich; das Wasser vs. das Gewässer (in both cases the latter term being the more officious). It's the watery element. The waters, upon which one should cast one's bread, not stones. I don't know what how sign wording tends to vary based on locale, but in my experience (Mainly in the San Francisco Bay Area) I would say the most usual way of phrasing a prohibition on a sign is "No [gerund-participial clause]", although "— is (strictly) prohibited" instead of "no —" is a common variation to make the injunction more forceful. There may also be an accompanying "violators will be prosecuted" and/or a citation to a statute. In a context where politeness might be more important (like a tourist spot), you might see "please [negative mperative clause]", possibly accompanied by a thank you. But in that context you wouldn't be likely to see the international "no" sign. I feel that, (on signage rather than speech, of course) imperatives are much more idiomatic in positive rather than negative form (cf "keep off the grass" vs. "No loitering"). It occurs to me now that another common construction – where the applicability of the injunction is something other than "everyone" – is a declarative moralized by "must". As in "Dogs must be kept on leash" and "Employees must wash hands". It might be interesting to look into what sorts of constructions are typically used on signs for what types of injunctions. As an afterthought, the emphatic red on "prohibited" makes me think the forceful phrasing was probably not an accidental artifact of translation. Smoking is prohibited sounds fine to me, even though No Smoking is probably commoner. Finnish, close cousin of Estonian, has "akvaario", but that's much more just the glass tank. Though one could have "ulkoilma-akvaario" for outdoor "aquarium" which could be a concrete pool/basin. No "akvatoorio" though — that's more or less how I would imagine the word would look like if Finnishuzed. "I would say the most usual way of phrasing a prohibition on a sign is "No [gerund-participial clause]", although "— is (strictly) prohibited" instead of "no —" is a common variation to make the injunction more forceful." 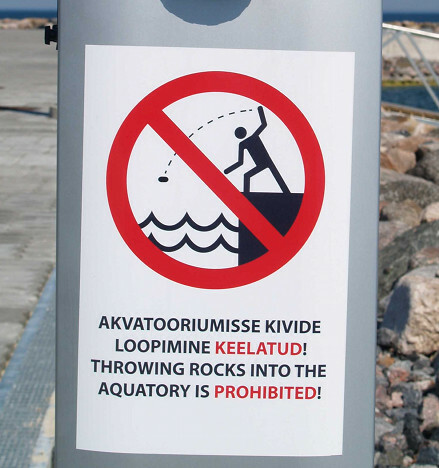 I agree, "No throwing rocks in water" would be okay (with elimination of some articles being typicall in signs as well). I think "(strictly) prohibited" implies either danger to the violator or others or major legal repurcussions if the person is caught (neither of which seems appropriate at first glance here). The word aquitorium is a term of international law that was coined in New Latin on the model of Latin territorium in order that students of international law be easily able to distinguish land under water and land not under water. Thus, once the word aquitorium was available, a narrower meaning could be given to the word territorium: it would be restricted to land that was not under water and thus its etymological connection to Latin terra 'land' would be more evident. New Latin aquitorium is the etymon of at least Estonian akvatoorium, German Aquitorium, and Polish akwatorium. The Estonian and Polish words show the influence of various words having /a/ as their second vowel (Latin requires /i/ here). The English noun aquatory could be specifically Estonian English, coined on the model of English territory and its seems to have resulted from the influence of the fourth letter of Estoniah akvatoorium. From the sign we know that akvatoorium is an everyday Estonian word at least in ports. In 1937, at the Great Lakes Exposition (held in Cleveland), Billy Rose produced The Aquacade, a show featuring swimming, dancing, and music, which he later took to the World's Fair in New York City (see the entry "Billy Rose's Aquacade" in Wikipedia). That proper noun (another of the several coinages modeled on cavalcade, such as motorcade) presumably inspired similar names for several public swimming pools. Possibly, Aquatorium in Indiana is one of them. Or, the Indiana word could have been inspired by the English word natatorium. Or maybe Aquatorium in Indiana is a blend of Aquacade and natatorium. In any case, the technical term aquitorium ~ aquatorium and the Indiana name are in all likelihood separate coinages. Possibly a student of international law could shed light on New Latin aquitorium and its reflexes in other languages. French: Défense de…, as in "Défense de fumer et de cracher" (= No Smoking or Spitting). Défense means 'prohibition'. I do not feel that any of those usages is hostile. The just lay down the law. "I do not feel that any of those usages is hostile. The just lay down the law." I don't find similar usage in other languages hostile either. But English speakers are usually more … indirect when it comes to telling other people what they should or shouldn't do (especially strangers). Words like forbidden and prohibited aren't used as much in similar signage in English speaking countries and seem kind of…. authoritarian? overbearing when they appear in translations. I think there's some personal variation here. For me, "No Xing" is more direct in that the sign is directly relaying the deontoligical force, and it's also explicitly negative by containing "no". "X is prohibited" doesn't purport to be placing an obligation on me by virtue of the speech act, it is merely reporting on the state of the rules. I also feel like it's softened by the prohibition being expressed lexically rather than through grammatical negation. On the other hand, use of "prohibited" more strongly expresses that the obligation is formalized in rule, which can seem more impersonal, so they are harsh in different ways. But either way, I don't know how much we can draw from one usage. In English signs sometimes something is prohibited and sometimes use other formulations – imperative forms, use of "no", "must", "only" etc. each varies depending on tone or context. I agree that this sign, especially with emphatic red and an exclamation point, is very forceful, but There are contexts where I might expect the same in an English sign. Of course, that isn't to say that I don't think the perceived level of politeness will vary with structurally similar sentences using cognate words across languages. I've noticed that my husband (a native Spanish speaker) has a different orientation toward many words than I do — for example, I tend to use "need to X" in certain contexts to mean something like "X is in your best interest", but he seems to gloss it as more like "I insist". In the other direction, I'm not clear on exactly when deber is most like "should" "must" or "have to". It's also my understanding from my intermediate level of understanding of the language that in Spanish the imperative voice is relatively forceful compared to English, with the ordinary indicative present tense often being preferred when the utterance has the force of a suggestion – a usage that would almost never occur in English; in English suggestions are usually imperative: "Try doing it this way" or interrogative: "Have you tried doing it this way?". You could also use a conditional: "you'll get better results if you do it this way". But non-conditional declarative "You do it this way" can only be interpreted as generic you, and we would never say "We go to the store" as a substitute for "Let's go to the store". In my first post of 27 October 2014, "and its seems to have resulted" should read "and its seems to have resulted." In connection with Guy's remark, "It's also my understanding from my intermediate level of understanding of the language that in Spanish the imperative voice is relatively forceful compared to English, with the ordinary indicative present tense often being preferred when the utterance has the force of a suggestion – a usage that would almost never occur in English; in English suggestions are usually imperative,"
in many circumstances, the present tense is indeed the polite form, for example, when ordering in a restaurant, "Nos trae dos ensaladas y agua sin gas" (literally 'You bring us two salads and non-carbonated water') is the polite form. The English equivalents would be 'We'd like…' and 'We'll have…'. (to my ear, the first of those English equivalents sounds more polite than the second one). Even more polite in Spanish is the present tense in an interrogative sentence, for instance, "El jueves, ¿me llevas al centro?" 'On Thursday, will you drive me downtown?' (literally, 'On Thursday, you drive me downtown?') or 'On Thursday, will you take me downtown?'. One would not use that construction in a restaurant, for example, because it would be overpolite. The software is not allowing me to publish my correction in the right way. I want to use angle brackets around the letter "a," as is the custom in codicology, but the result is a blank space. Let's try it this way: In my first post of 27 October 2014, "and its seems to have resulted" should read "and the second instance of the letter 'a' seems to have resulted." David: The software allows formatting in comments using HTML, and that's why it's eating your angle brackets (which denote HTML tags). If you're not familiar with HTML, there are any numbers of tutorials and references available online. But for your immediate purpose, use &lt; and &gt; instead of < and > (and check the preview to make sure you're doing it right). @Cheryl Rofer, you might not find it in the "Inglise – Eesti Seletav Sõnaraamat" but you will in the "Eesti keele seletav sõnaraamat" (online here), translating, for those of you who slept through Estonian 101, as "permanently water-covered area/zone, expanse of water, water area/zone", as illustrated by "Vaikse ookeani akvatooriumi keskosa" (the central region of the Pacific Ocean aquatory) & "Sadama akvatooriumi süvendamine ning puhastamine" (Google translated as "Port basin dredging and cleaning") (similar to your EKI definitions). Since Estonian also has the term territoorium, with the definition starting as (kellelegi kuuluv) piiritletud (maa-)ala Linna, valla, ettevõtte territoorium. Tehase, sadama, kloostri, laagri territoorium [circumscribed/bounded (land-)area (belonging to somebody). Town, county, company territory. Factory, port, convent, camp territory], akvatoorium looks like a logical adaptation from that. Also, judging by the plan on (Riga Commercial Port's website, see also Croatia), it seems clear enough to me that this is a term adapted from "territory" to represent a water-based legal or official possession, which makes perfect sense for a port which necessarily has part of its territory on land and part of its, um… which has territory on land and aquatory on water. As to how idiomatic the sign is, I agree with the general tenor that "Don't throw rocks into the water" (or similar) is more English, but what the Estonian formulation suggests is that it's referring to a legal, and probably State entity, in other words something big and hairy and more likely to chase you with fines or other nasties than would a common or water-garden "Don't throw rocks" sign. Thanks to Hilary Bird of Xenophobe's Guide to the Estonians fame for bring this to my attention! Well, I am Estonian and the word 'akvatoorium' is rather strange for me. In most of the cases we would rather use the word "water" (est. vesi) rather than 'akvatoorium', so in this case it would be 'Kivide vette loopimine on keelatud'. Most probably the sign was just made by someone who thinks that using complex words make you look cool. Agree, but quite possibly translated by someone on the Estonian legal text translation team, and having to comply with official terminology.